One of the highlights of CES 2018 earlier this month was the introduction of an enterprise AR reference design from Flex. We spoke about it recently with Geof Wheelwright, director of marketing communications for Atheer, AREA member and a partner in the Flex announcement. AREA: What is the purpose of the Flex enterprise AR reference design unveiled at CES? WHEELWRIGHT: The purpose of the Flex AR reference design is to reduce time to market for companies making AR devices for enterprise and consumer applications. It includes a complete product specification, including a head-mounted display (HMD), an external processing unit (EPU), a gesture-based software platform (developed with Atheer) to manage interaction, and pre-installed Enterprise AR software. By customizing the rugged, stable and high-quality Flex AR reference design versus developing their own AR hardware, companies can significantly reduce product development costs and quickly scale manufacturing. AREA: What is the significance of this announcement to the enterprise AR market? WHEELWRIGHT: The significance of this announcement is that it provides a new standard for AR hardware and interaction – and a very real path to a much broader range of participants in the enterprise AR hardware market. It also goes beyond a mere hardware specification by including an interaction model that is multi-modal (i.e., it supports head motion, voice control and gestures) and a 30-day trial of Atheer AiR™ Enterprise. That means customers can immediately start using remote expert collaboration (“see what I see”) and authoring and deliver workflows and step-by-step task guidance for their unique needs. In addition, Flex will provide a full software development kit (SDK) to customers who are building on Android Nougat. The sum of all those parts means that OEMs have access to an AR offering that can provide real value to enterprise customers right out of the box. AREA: Can you give us an example of how the reference design reduces time to market? WHEELWRIGHT: A typical hardware development cycle would involve bringing together a number of key standardized components (including operating system, processor, specialized hardware) around a particular design for a particular purpose. Hardware designers would then build and test prototypes, refine those prototypes (and then retest them as they add new components), field-test and debug the prototype. They would then have to figure out how they would manufacture the device. And all of that is before you run a single piece of third-party software on your new device. 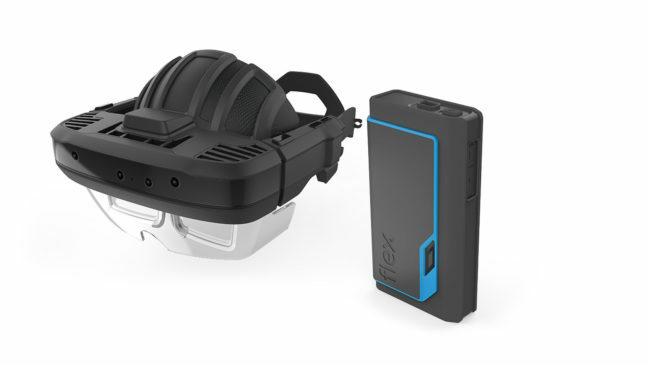 Manufacturers using the Flex AR reference design get the advantage of a pre-designed system that is already tested and already works – cutting out a lot of the time typically involved in new hardware development. It includes cutting-edge technology from partners, including the Snapdragon 835 mobile platform from Qualcomm, designed to deliver full-color, 1080p augmented reality experiences. The Snapdragon 835 draws 25 percent less power than previous models, using an advanced 10-nanometer design. AREA: What is Atheer’s role in the reference design? AREA: Why has Atheer partnered with Flex? WHEELWRIGHT: Flex has the global reach, experience and respect in the electronics hardware manufacturing industry to help make our interaction model an industry standard – and bring enterprise users the real and immediate safety and productivity benefits of our flagship Atheer AiR™ Enterprise software. AREA: Does this represent a change or an evolution in the Atheer business strategy? WHEELWRIGHT: It represents an evolution. In 2012, Atheer was founded on a belief that AR technology could make a significant and measurable difference in how workers at industrial enterprises do their work. In the company’s initial stages, the Atheer team explored the ideal hardware needed to create impactful enterprise AR applications. It also affirmed the idea that, in order to be really useful, AR hardware would need to be based on popular, well-supported mobile operating system platforms (starting with Android). That work led initially to the development of Atheer AiR Glasses, which later become the foundation for a reference design platform called AiR Experience that Atheer now sells (combined with a multi-modal interaction platform and access to Atheer’s partner engineering team) and is a key element of the work with Flex. The company now offers Air Experience alongside its flagship Atheer AiR™ Enterprise software, which provides real and immediate benefit for customers such as Porsche Cars North America, Inc. (PCNA). PCNA announced late last year the introduction of “Tech Live Look,” an AR technology designed to improve technical services at Porsche dealerships in the United States. “Tech Live Look” uses AiR Enterprise™ in conjunction with lightweight smart glasses. AREA: Can we expect other similar partnerships to be announced in the near future? WHEELWRIGHT: We are continually evaluating other partnership opportunities to help grow the market for AR solutions in the enterprise that leverage our experience and help bolster the development of key interaction standards for the AR industry. AREA: How will this and other partnerships accelerate the adoption of AR in the enterprise? WHEELWRIGHT: Enterprises want measurable value, power, interaction standards that make sense – as well as proven enterprise-grade applications using hardware from manufacturers they trust on operating systems they know. Our platform delivers all of those elements and helps to significantly lower barriers to adoption in a way that should move customers from limited, line of business-driven “proof of concept” lab trials to serious IT-supported evaluations that can be rolled out broadly throughout an enterprise.